There were 2 posts published in October 2007 (this is page 1 of 1). Well, after a couple years of tending and loving the Quilter Street Olive Tree has borne enough fruit to harvest. So – I’ve decided to follow through and see if I can turn these into edible olives. I was going send them down to an olive farm in Devon that I found on the web, but sense prevailed: I didn’t have enough to moisten the gum on the envelope, let alone get a litre of oil. So – to “Olive Austalia” and their preserving instructions . I’m going to try the “simple” approach to preserving these: soak in water for a couple of weeks (changing daily) and then moving to brine solutions. Now, by the time we do the weekly taste test for 3 months I know that I’ll only have 12 left, even if they’re not spoiled, but this is a case of the journey being as important as the destination. Further updates – maybe not quite on a weekly basis – but you can check out progress in the Quilter Street Olive stream on Flickr. 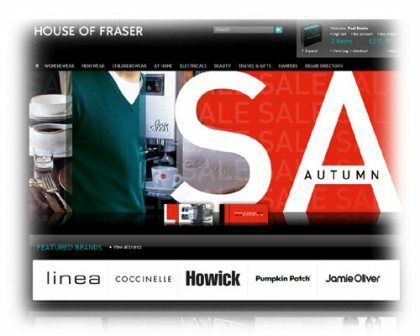 Paul Rouke has written a very nice review of the launch of the House of Fraser ecommerce site on the e-consultancy blog. As you may know I’ve been working with HOF since February on this project (and recently posted the Telegraph’s coverage of the launch on this blog). Paul’s coverage is much more thorough and it’s rather spooky that he’s noticed (and credited) the areas upon which we worked really diligently, as well as picking out some areas of great annoyance that – yes indeed – the HOF team are beavering away to improve. To give a bit of ‘behind the scenes’ perspective, while the Board determination to commit to fuller multichannel operation was in place during 2006 it was only in January 2007 that the company started to develop the functional requirements. From that date (ISTR it was January, the day after I’d been chatting to Paul in Manchester at a Digital Shorts evening…) House of Fraser and the wider group have: created a new platform and best practice company (www.ecommera.co.uk), procured an ecommerce platform (Demandware), appointed lead system integrators and lead creative agency (Javelin Group and LBI respectively), established a contact centre (www.becogent.co.uk) and an outsourced warehousing and logistics operation (www.iforcegroup.com). On top of the platform itself there’s some nice imaging magicke from the good folk at Scene7. All of this has been put in place, from first meeting to launch, in 6 months. Now, there are many further blog posts on my views on developing a complex system with so many partners, and of course many blog posts that I’m totally unable to write on the matter (!). However, it’s a remarkable achievement and very much to the credit of HOF: their Board for a supportive, clear vision and ongoing engagement in the project; a wonderful project leader (step forward, Colette Wilson), a massive level of ambition from all the partners that this would be a high-water mark and reference for them all; and finally immense amounts of good will and common endeavour from the parties. With the launch now receding in the rear view mirror the adrenaline’s subsiding and the ongoing questions of performance improvement and site development come to the for. Welcome to eCommerce!